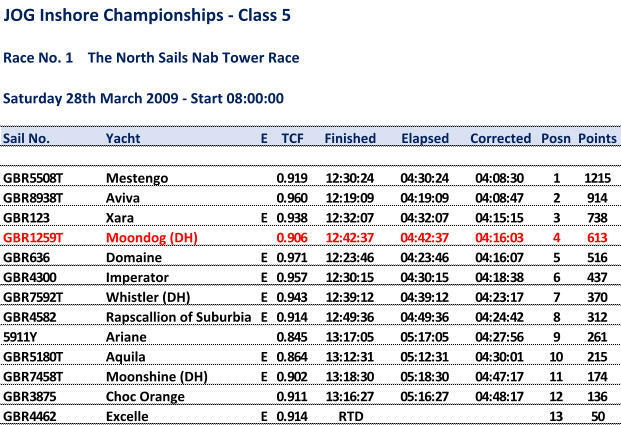 Another windy NAB Tower race with a good force 6 gusting 7 most of the time. Down wind down tide start and thought we had it nailed after two practice runs but the race committee deemed us OCS so we had to go round again and give the fleet a two minute start. Chicken chute up once the wind moved aft past Cowes and kept it up all the way to the NAB in under 2 hours. Watched a number of the boats in front sagging off on the tide as they approached the tower and made up a few places before we headed back in the teeth of a strong breeze. No.3 and two reefs for most of the beat back and managed to shatter two sheet turning blocks on successive tacks. Shook one of the reefs out not far from the finish and came in fourth overall which was pretty good for a windy race and only two up.